Alabama Crimson Tide Speed Mini Helmet by Riddell #17 - Login for SALE Price | Sports Memorabilia! 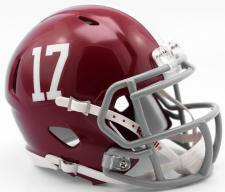 The Alabama Crimson Tide #17 Mini Helmet by Riddell is a great collectible for the Alabama Fan! The Speed mini has a Speed style shell, interior padding and a 4 point chin strap. Speed mini helmets feature official colors and decals.